Our specialist Employer Branding Practice work though a 12 step framework to assist organisations to capture an employment brand that will help them attract and retain the right people, heighten employee engagement and positively affect the bottom line. Brief descriptions of each step are supplied. For more information, please contact one of the Employer Branding Practice Team - they will be delighted to help. The first step in an Employer Branding project is an indepth meeting with an Employer Branding Consultant to confirm the required outcomes and business objectives; identify a project team and project sponsors; and agree a timeframe and budget. This step lets us understand how leadership view the organisation's mission, vision and values, and what they view as important in the employer-employee relationship. This is done through a leadership workshop or selected leadership interviews. Working in consultation with HR and nominated leadership, we identify what is required from people to deliver on business objectives and how this impacts on exisiting workforce planning. This data may include employee surveys; performance management systems; exit interviews; policy and procedure documentation. Once this data is reviewed, we identify what additional research is needed to develop the Employer Brand. Based on the information from the previous steps we provide a fully scoped and costed program proposal which includes business objectives, findings to date and the proposed candidate, employee and other group research now required. On approval of the proposal, we facilitate the focus groups and interviews to gather the required data. We also include quarititative research methods such as surveys to validate initial data across a larger sample group if required. This report includes the outcomes of the gap analysis along with recommendations on the specific messaging and methods that should be used to close the gaps. The Employment Brand Blueprint will also include draftvisual concepts. The 'look and feel' of the messages are key components in the Employment Brand blueprint. These concepts will demonstrate how the messages work to affect people on both emotive and rational levels to influence their perceptions. Following the presentation and approval of the Employer Brand Blueprint, we then develop the Brand Campaign in order to execute communications that will engage employees, attract candidates and improve retention. This stage involves fine tuning of messaging specific media and communications recommendations to internal and external audiences as well as a tileline and costs. 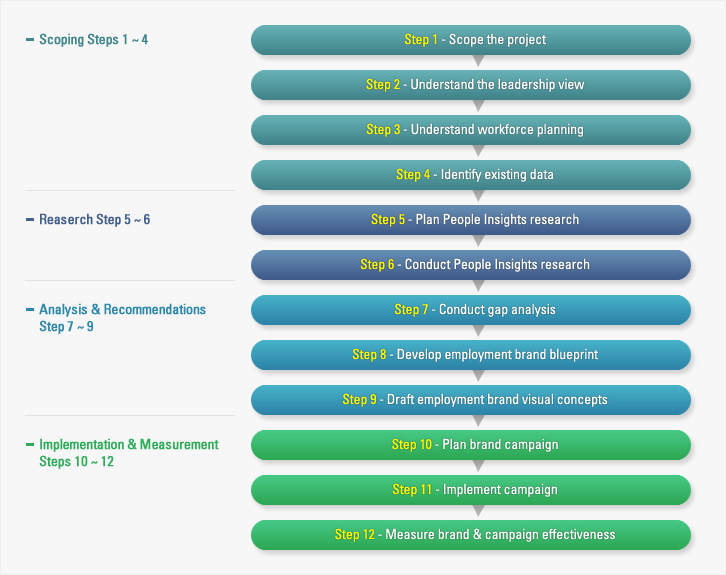 This step is the project management of the Brand Campaign. Every element recommended and developed will help close the gaps identified through the research and analysis. Regular review meetings are set to ensure capture of campaign effectiveness and to plan further activity.